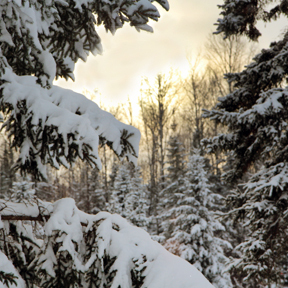 Northern Wisconsin has had a particularly blustery winter. Which means I’ve been checking in on my beehives more often than usual. Any time I hear talk of an Alberta clipper coming our way I make a trip out to the girls. And then I always check in on them again after the cold snap breaks. Of course my visits can’t really change the outcome of things, but still, I like them to know that we’re in this cold mess together. I also visit them after significant snow falls. If we get more than a few inches, I’ll need to clear away their bottom entrances so the hives maintain adequate airflow. At least on these trips I feel useful. Another chore is to keep the electric bear fence shoveled out. It’s a small thing, I know, but it feels good to get the beeyard nice and tidy before checking in with each hive. By “checking in” I mean sitting down next to the hive and putting an ear up right against their top entrance. Sometimes it’s faint, but if you listen hard, you’ll be treated to the most magnificent buzzing. But the buzz isn’t actually the sound of their wings moving. It’s the vibration of their flight muscles. In essence the bees generate just like we do – by shivering. It’s a remarkable thing though. 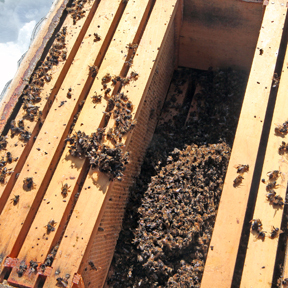 Thousands of constantly shivering bees produce a core hive temperature of about 90ºF. I wish I could bring on 90º temps just by shivering. As the bees on the outer edge of this shivering mass get chilled, they move inward, pushing warmer bees out for a turn on the edge. Go team! Naturally, the colder it is, the harder the bees need to work to maintain their cozy hive temperature. And just like humans, the harder they work, the more calories they need. This raises two potential problems. If it stays too cold for too long, it gets difficult for the bees to break away from their big warm cluster to access their honey stores. It also means they will need more honey than usual to make it through the winter. Which is why Alberta clippers make me nervous. My usual routine when visiting the winter bee yard is to shovel first, check second. But on my most recent trip, I went straight to the hives. Something in me must have known. I listened to each hive, but the life I craved wasn’t there. All three hives we quiet and still. Sweet queen Freeda, her newly established daughter hive, and even the boisterous and obnoxious girls of Valerie’s hive had moved on. I stared up into the colorless sky and waited for sadness to seep into me. I know it sounds silly, to be emotionally attached to a box of stinging insects, but I am. Deeply. Which I guess just speaks to the extraordinariness of honeybees. The bees know something. And unlike humans, they have not forgotten. They have not buried their instincts. Nor have they managed to hide behind the veil of something better. I yearn for their sacred knowledge. I cling to it. So I watch and listen. And in doing so, they give me infinitesimal drops of wisdom. 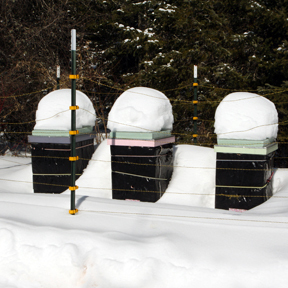 Finally I manage to pick myself up from the snow and, because I don’t know what else to do, I shovel out the hives. While I work, I berate myself, wondering if I have failed my bees. Did I leave them enough honey? Did I wrap them differently, causing unforeseen airflow issues? Did they go into winter with too small of a population? Probably, after all my late summer shenanigans trying to “help” Freeda split her hive into two. Freeda’s hive is the one I will miss the most. She gave me something extra, something unnamable. Enough. I shake off my sadness and instead focus my energy on opening my heart to the new arrivals who will come later in the spring. I think of the delight in getting to know each new hive. And in the meantime, I’ll be able to go through my equipment, remove old comb, and make any other necessary hive repairs. Fresh starts are good, I try and convince myself. Weeks later, on a Saturday morning, I find one of the last seats in the crowded basement of the Salem Baptist Church. About 60 of us have gathered for the Northern Wisconsin Honey Producers annual spring meeting. The room is a quirky mix of old timers and newcomers. We’re a funny lot, beekeepers, but the one thing we have in common is our willingness to sit on folding chairs in a church basement for hours on end to talk bees. As I settle in, my neighbor informs me that Verne has already been by. Verne is our club’s secratary. Every fall he takes the honey report and every spring he takes the overwintering report. I go over, and with a sigh, give him my data – went in with three, lost three. A few minutes into the meeting Verne is ready with a rough statistic. Out of 269 total hives going into winter, 125 are still living. Which means about a 46% survival rate. This low number saddens me, but as the meeting forges on, my curiosity and love of bees is sparked even higher. Bee keeping is a tricky business to be sure, but you can count me in. There’s so much more I need to learn from them. I’m sorry you lost your girls. That’s a bummer, especially after all the drama last summer. I hope you have a good spring. Please don’t give up! I have two hives still buzzing here out of four- One was a swarm that we never expected to make it so I am taking a 66 per cent survival rate. Yipee Carol! So glad to hear your good news. It’s not too early to start giving them sugar syrup and pollen if they are low on food. Said like a true Broeker, never thinking as a failure just move on a wiser person. Best to you this coming bee season. Yes, I find it strange that there really isn’t much “to do” for my bees in the winter. I’m a livestock farmer with cows and sheep, and there is plenty of things that need doing all the time. That gives me the feeling that I’m “taking care” of them. I have to rely on the bees to take care of themselves.